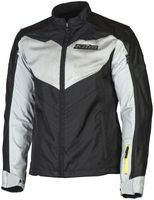 The Apex Air jacket is a combination textile and leather jacket so it’s built for maximum crash protection and durability, but it’s engineered with a great deal of venting features, so it will be useful in a wide range of temps. First off, I’m a fan of the leather overlays on this jacket. The leather is thick and soft… just what you’d expect in riding gear, but the surface is unique looking. I can’t say exactly how it is done, but the surface looks like it was laser etched in a tight diamond pattern. It gives the leather a high tech, sporty look (see our close-up picture to see what I mean). As I said, the venting is EXTENSIVE. First, there are very long arm zipper vents. You can open these up from either direction and you’ll have about a foot and a half long vent on each sleeve. And then there are two large mesh intake panels on the upper chest. These vents have zip down panels (one behind each vent) inside the jacket. You can lower those down for full air flow or zip them up when it is cooler. And finally, there is a similar type vent in back. A panel zips down and stows in a pocket down by the waist leaving a very large mesh area. Other features are common to most other Klim jackets… the usual assortment of pockets for storage including the medical ID pocket on the sleeve and the hidden inside “passport” pocket. This jacket has a zip to attach to Klim pants with the mating zipper too. Klim leaves it to you to use your own layers under the jacket. The Zephyr Wind Shirt is sold separately (see below) as the ideal thing to block wind in cooler weather and to provide a water resistant barrier. The only feature of this jacket I don’t much care for is the snap arrangement at the sleeve. There are three snaps, and the first one is easy, but it’s kind of a pain to try to use the center snap or the most snug snap. This probably won’t be an issue for most people but it could have been designed better. .